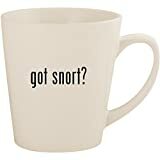 On spray of Turbo Snort Energy Shot Nasal Spray delivers 1mg of caffeine through the nasal membranes. This method has a high absorption rate which therefore results in fast effects despite the small dosage. Each spray also delivers an amino acid blend. 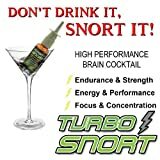 Turbo Snort is spearmint scented and also helps to clear sinuses. There are 223 metered sprays per bottle and the recommended dose is 2-4 sprays per nostril. Brandon was sent a bottle to try. Here's what he had to say. 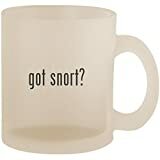 I gave myself 2 good sprays in each nostril and got a very refreshing peppermint scent although it did make my nose run a bit. My nasal rush lasted me about two and a half hours before fading out with no crash. This is pretty impressive since he only received a mere 4mg of caffeine.